The word ‘Tsunami’ is of Japanese origin, which means, “harbour wave”. 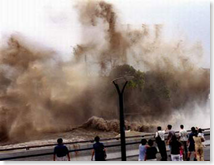 The phenomenon we call a tsunami, is a series of extremely long waves with long period. These waves are primarily associated with earthquakes occurred under oceanic bottom or near coast. Volcanic eruptions, landslides, nuclear explosions and even outer space objects impacts can also generate tsunami. In the deep ocean tsunami speed can exceed 1000 km/hr , tsunami length from crest to crest may be a hundred kilometers or more while height may be only a few centimeters so people aboard cannot feel them. 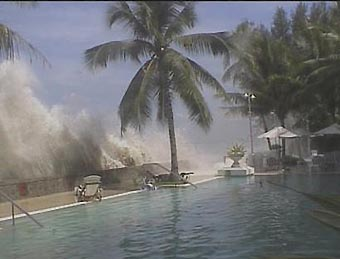 The deadliest natural disaster caused by the tsunami generated from an undersea earthquake on 26 December 2004 in the Indian Ocean has shaken up the world. The 2004 tsunami generated waves of up to 15 meters in height and even hit Somalia at a distance of about 4500 km west of the epicenter. The tsunami traveled slowly and took seven hours to hit the farthest coast at the west. Because of the 1200 kilometer of the fault line affected by the seaquake was in a nearly north-south orientation, the greatest strength of the tsunami waves was in the east-west direction. Almost all the countries situated around the Bay of Bengal were affected by the tsunami waves in the morning hours of 26 December 2004 (between 0900 – 1030 hrs IST). The killer waves were triggered by an earthquake measuring 8.9 on the Richter scale that had an epicenter near the west coast of Sumatra in Indonesia. An estimated 10,700 were killed in India.The first recorded tsunami in India dates back to 31 December 1881. 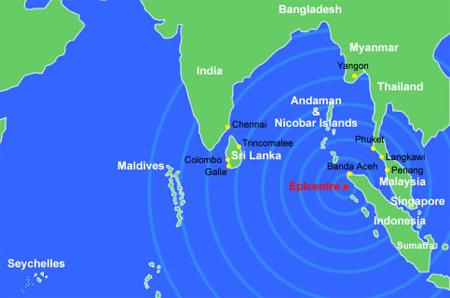 An earthquake of magnitude 7.5 on the Richter scale, with its epicenter believed to have been under the sea off the coast of Car Nicobar Island, caused the tsunami. The last recorded tsunami in India occurred on 26 June 1941, caused by an earthquake with magnitude exceeding 8.5. This caused extensive damage to the Andaman Islands. There are no other well-documented records of Tsunami in India. Pacific Tsunami Warning Center (PTWC), operated by NOAA in Ewa Beach, Hawaii, USA, is one of two tsunami warning centers in the United States. PTWC is part of an international tsunami warning system (TWS) program and serves as the operational center for TWS of the Pacific issuing bulletins and warnings to participating members and other nations in the Pacific Ocean area of responsibility . It is also the regional (local) warning center for the State of Hawai’i. West Coast/Alaska Tsunami Warning Center (WC/ATWC) in Palmer, Alaska, serving all costal regions of Canada and the United States except Hawai’i. Yuzhno-Sakhalinsk Tsunami Warning Center(YSTWC): For the Russia, YSTWC has responsibility as National Tsunami Warning Center to provide tsunami warning service for any tsunami impacting Russia national interests. YSTWC predicts the tsunami arrival times, coastal impact if possible, and must provide timely and effective information and warnings to all national interests to minimize the hazards to human life and safety. 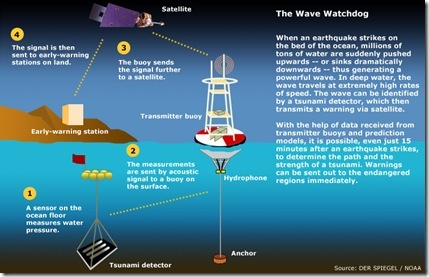 The warning system comprises a real-time network of seismic stations, BPRs and 30 tide gauges to detect tsunamigenic earthquakes and monitor tsunamis. The tsumanigenic zones that threaten the Indian Ocean were identified by considering past tsunamis, earthquakes, their magnitudes, and the location of the area relative to a fault and also by tsunami modelling. The east and west coasts of India and the island regions are likely to be affected by tsunamis generated by earthquakes from two potential sources — the Andaman-Nicobar Sumatra island arc and the Makran subduction zone, north of the Arabian Sea. Has the capability to detect earthquakes of more than 6 magnitude. It would now take 30 minutes to analyse the seismic data following an earthquake. The next task is to reduce the time to six to seven minutes. Four Bottom Pressure Recorders (BPRs) are now deployed in the Bay of Bengal, two in the Arabian Sea and another six would be installed in five to six months. The center was successfully tested during the 8.4 magnitude earthquake that hit Indonesia last month,12 September 2007. India will share data and information about the earthquake and ocean surges with its neighbors. Nearly 400 million people living in India’s coastal belt are vulnerable to oceanographic disasters. INCOIS, in collaboration with Tata Consultancy Services, has generated simulations of 550 possible scenarios of triggering of tsunami after massive earthquakes. 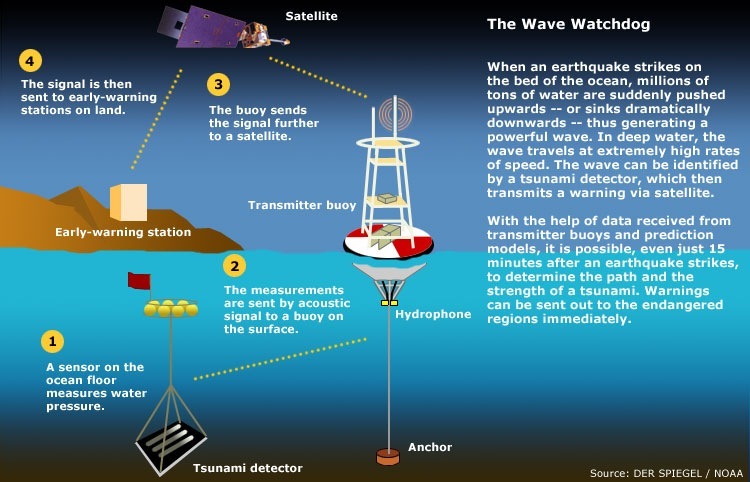 5.An animation of a Tsunami Warning System. OldSailor recommends that you watch the animated illustration of a Tsunami warning system. Click here to watch the animation. Most of tsunami are generated by earthquakes occurred under the ocean floor, more often at peripheral parts of the Pacific. Potentially dangerous parts of coast are the low lying ones situated along the beach in gulfs and bays with heights less than 15 m above sea level when distant tsunamis are observed and less than 30 m in case of a local tsunami occurring. A tsunami is not a single wave, but a series of waves. Therefore, stay out of dangerous zone until all the waves are passed or an “ALL CLEAR” is issued . A danger of tsunami may exist for a few hours. Pay attention to distant tsunami warnings. Any undersea earthquake occurred near coastline may generate a local tsunami. If you felt such quake, leave the beach immediately. 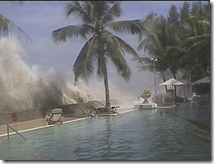 Approaching tsunamis are sometimes heralded by noticeable rise or fall of coastal waters. Such sign always must be a warning. Never come down to the sea to have a look at opened bottom or tsunami. Tsunamis can move faster than a person can run! It may be too late! Taking in account the first tsunami signs, mentioned above, keep calm and quickly move to higher ground (from 30 up to 40 m above the sea level) away from the coast. 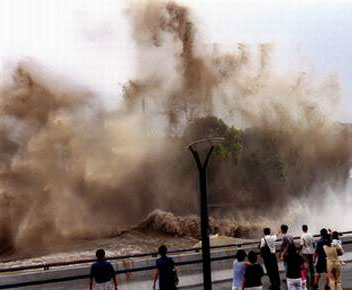 Tsunamis can travel up rivers that lead to the ocean, so you must come up a slope and not along a riverside. If there isn’t a higher ground you need come away from coastline on distance from 2 up to 3 kilometers. If you are on a boat or ship and there is tsunami warning, move your vessel to deeper water ( at least 50 m). When no major waves have been observed for two hours after the strong quake it may be assumed that the tsunami threat is over. Let us know if you got any questions, we would be glad to answer it. India’s early warning system for tsunamis, put in place in October 2007 at a cost of Rs120 crore, may not be able to send a warning when the gigantic waves strike next because of alleged damage by fishermen. 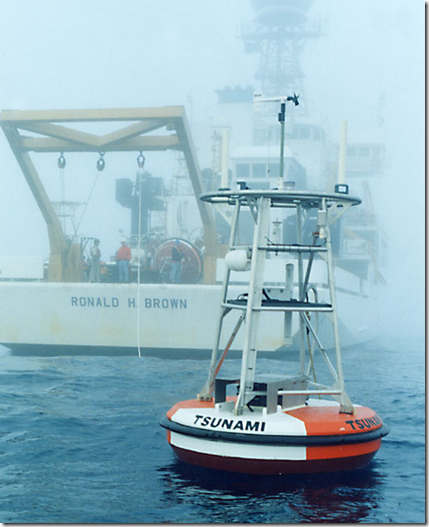 It is reported that four out of the six buoys installed for tsunami warning are not working. Replacing a buoy would cost almost Rs 5-10 lakh. It is now suggested that there must be an arrangement between the Indian Coast Guard and the Earth Sciences ministry to have special monitoring of these buoys and fishermen must be made aware of the importance of these buoys. Read more from LiveMint.